I (Kartik Sethi, B.Tech. Final year at BITS Pilani, Hyderabad Campus) interned at the Precog Research Group of IIIT Delhi in the summers of 2017 (May – July). I have tried to express my experiences through the following paragraphs. A – Amazing was the word, which flashed in my mind when the programme started. B – Best environment and bonhomie was the hallmark of the internship. I found the environment and infrastructure in IIIT as one of the best in any such institution. C – Challenges. Every difficult problem is usually entailed with an innovative solution and every new solution is associated with challenges of its own. I also did face many hurdles during the course of my projects, but the peers at Precog were always ready to offer help and render their valuable inputs. D – Deep Dive. These are the fortnightly in-depth sessions similar to WhatsUps (more about it in later paragraphs) where people get opportunities to share their project ideas, their ongoing project progress and take relevant feedback from other participants. One important aspect to gain from these sessions was that regular feedback is an essential prerequisite for any important research project. E – Exploring new vistas and avenues. We got so many opportunities to learn and experience new vistas, ideas, and avenues. This was the first time when I got the taste of what real hard-core research is. I got to experience all the nitty-gritties related to approaching a research problem. F – Family. The atmosphere here at Precog is more like a family. A family, who gels together, discuss together, sits together, enjoys going out together, dining out together and group members coming forward to each other like a well-knit family. G – GPUs. Precog has many CPU servers and 3 GPU servers (two NVIDIA GTX 1080 and one NVIDIA Titan X Pascal!, currently the best in the market) with high computational specs. My projects were related to Deep Learning, so I had the opportunity to tinker with these amazing tools. H – Hackathons. During the course of the internship, we worked on some challenging problems in the form of Hackathon(s) where all of us (interns, PhDs, RAs) brainstormed and collaborated to find innovative solutions. I – Interns. I got the opportunity to work and collaborate with some of the most ebullient and brightest minds of the country belonging to various reputed institutions. It was the ravenous attitude of everyone in the group to crack arduous research problems, that kept me going and made me do better and better. Overall, it was an amazing experience getting to know them, work and learn with them. My journey at Precog was indeed a roller coaster ride, filled with momentary disappointments (in not achieving the desired results) and spans of joyful triumphs (when I actually figured out where I was going wrong). K – Keenness to learn. The atmosphere at Precog brings out the best in you. The internship serves as a great platform to gauge your research interests and work in the direction of the research areas which one likes to pursue. L – Learning. My projects were related to Artificial Neural Networks (namely CNNs and LSTMs). The problems that I tried to tackle allowed me to experience a holistic learning in terms of concepts and ideas that have been tried and the improvements that can be ensued. M – Mahasabha. Also known as Intern Mahasabha, it is basically a one to one session with PK, where we can share our progress regarding the projects and also if we are facing any problems. The session is informal so one can discuss about other things as well, even not related to Precog. O – Openness. The openness of every member of Precog is admirable. You can approach anyone for help (even the Precog Alumni). One will surely receive new ideas to try and also, there might be moments of constructive criticism, which is necessary for getting results in any kind of research. P – PK. I still remember that awe-inspiring moment when I first researched about PK and the work that has happened at Precog. PK as a supervisor is the coolest faculty one can ask for. He is an epitome of a mentor who motivates, guides and supports you to a great extent. He makes sure that every individual in the group gets ample opportunities to discover their true potential and so that they can hit the acme of their goals. It was a fabulous experience to work with him as his mentee. He is truly the glue that holds this (Precog) family together. Q – The Quality of research at Precog is at par with other research institutes in the country. S – Socials. The group is not at all limited to only work, we had regular fun outings, also known as #PrecogSocial. The outings ranges from PK’s place (yeah, you got that right!) to Barbeque Nation, etc. T – Tenacity. The tenacious work environment and challenging projects kept me driving throughout the course of the internship. U – Ultimate experience. The overall experience was ultimate at this institution, where one could learn to any extent. V – Precog helped by giving me a Vivid picture of what and what not I want to pursue in future. W – WhatsUp (WU). 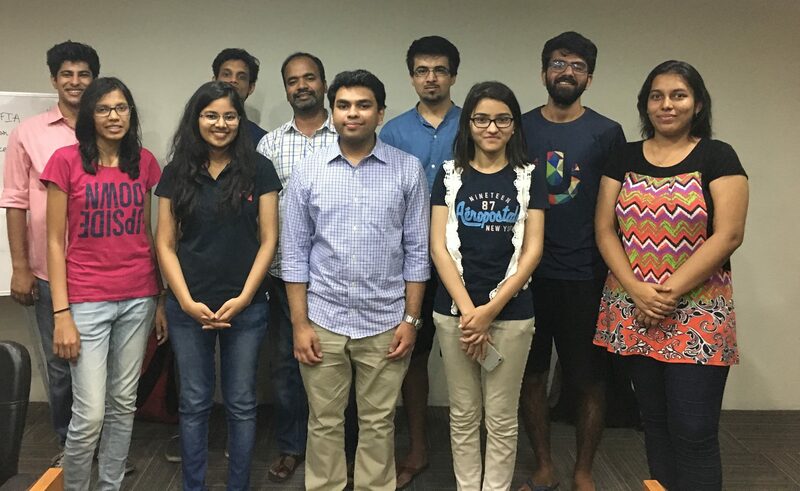 Toned down version of DeepDives (DD), these are the bi-weekly sessions (with the entire group), where Precogers discuss their projects, ask for suggestions and give interesting inputs. Through sessions like WUs and DDs one gets to know about the different frontiers of research happening around you. X – The Xenial relationship that I have shared with Precog is something that I will cherish for the rest of my life. Z – The Zealousness that I have seen in every Precoger, to solve problems related to social good is truly inspirational. At the end, I would like to mention that Precog is a wonderful group to learn, work together and there are numerous opportunities where one could excel. Therefore, if someone is looking for an all round and comprehensive research experience or want to make a career in research, it is one of the best places for him/her to start their journey. Here’s a glimpse of the Precog family.